Please join us for a Town Hall meeting to learn about what ISD is currently doing to ensure safety and security of our community. Please stop by to shop and buy food for your afternoon snack and take home dinner. Bring your family and friends. Also, invite your neighbors and enjoy a day full of fun! 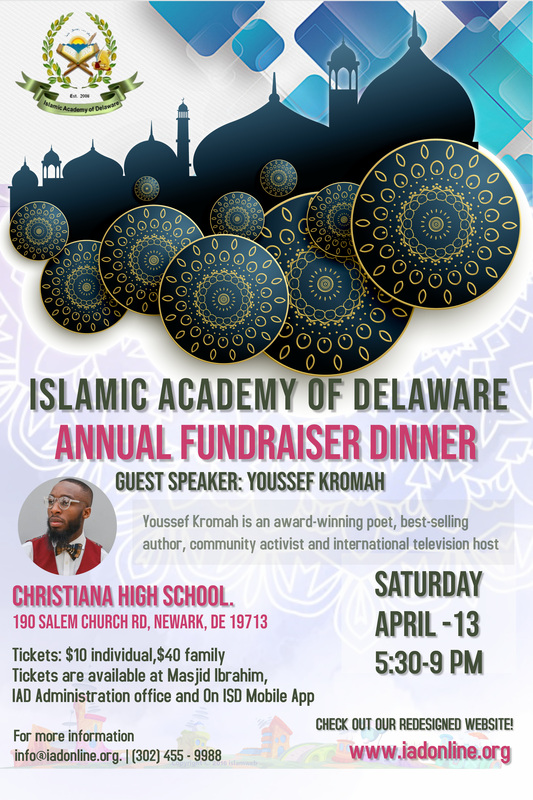 Please mark your calendars for the upcoming Fundraising Dinner for the full-time school, the Islamic Academy of Delaware. The guest speaker will be Youssef Kromah. He's is an award-winning poet, best-selling author, community activist and international television host. Tickets are available at Masjid Ibrahim, IAD Administration office and On ISD Mobile App. Help clean the single most important natural resource in our region – The Waterways. The Christina River Watershed provides 75% of the public water supply for residents and businesses in New Castle County. A solid effort is needed annually to improve wildlife habitat and keep Delaware waterways free from debris. This event is a great family outing while doing constructive work for the community. 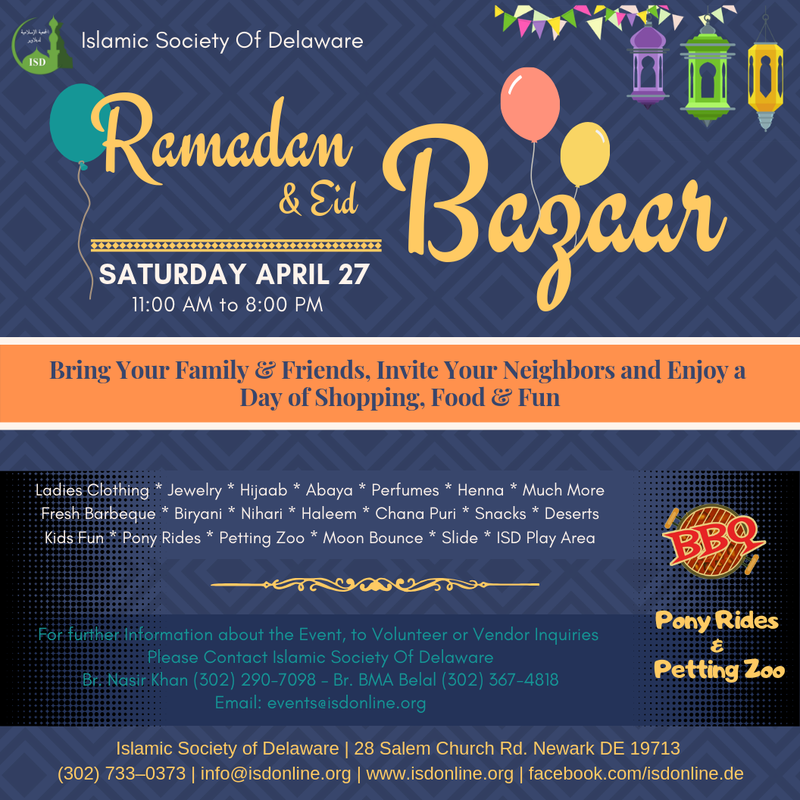 Islamic Society of Delaware has been involved in this effort for past 10 years and this year again volunteers from ISD will work together to keep our environment clean. 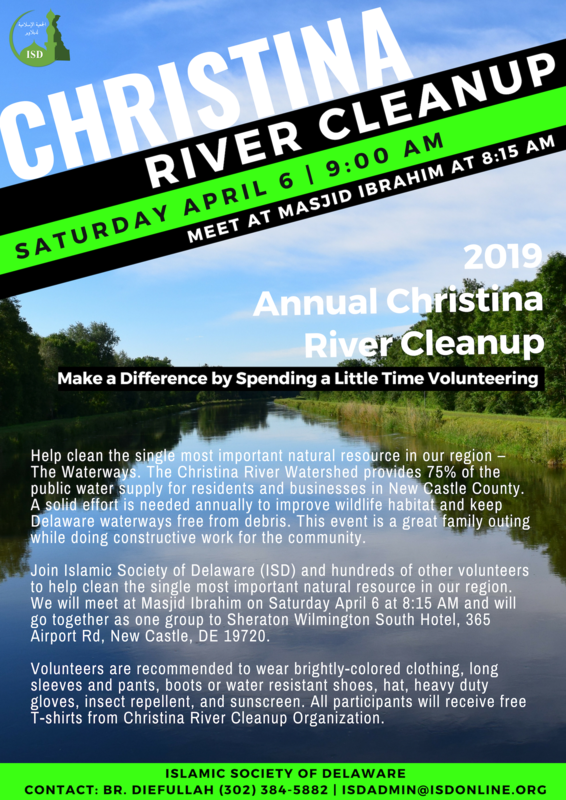 All volunteers are requested to meet at Masjid Ibrahim on Saturday, April 6th at 8:15 AM to go together to Sheraton Wilmington South Hotel, 365 Airport Rd, New Castle, DE 19720 and join with other volunteers. The next community family halaqa will be after maghrib prayer on Friday, April 5th, 2019 at 7:30 PM. The topic will be: "Overcoming Difficulties" by Sheikh Abdel-Hadi. Please bring your favorite dish to share with the community.